So – I don’t know how many people actually care about British politics, but over this past week Scotland had an epic vote regarding whether they should be an independent country or remain part of the United Kingdom. Good sense prevailed and Scotland remains part of the UK! In celebration, I decided I should make a meal with one dish each from Northern Ireland, Scotland, England, and Wales in order to celebrate. The menu ending up being Glamorgan Sausages for Wales, Bannocks for Scotland, Buttered Cabbage for Northern Ireland, and Glazed Carrots and Stilton cheese (separate, not together) for England. Since the cabbage and carrots are fairly straight-forward and easy (and this was a lot of food) – I’m just going to go through the bannocks and the glamorgan sausages. Take the oats and turn them into something resembling flour. This can either be achieved with a food processor, or by chopping them very finely with a knife. Since I don’t have a food processor, I did the latter. It’s totally doable, but takes awhile. Stick the oat flour into a bowl, and mix with the normal flour and the baking powder. Cut in the butter, then add in the mix. Mix – it should be a slightly stiff, slightly sticky dough. If it needs more flour, add some and add some oats (unchopped). Roll out into something resembling a circle. Then you can either pan-fry it in butter, or bake it in the oven at 375. I actually tried both methods, and both are good, so its really up to you. Saute the leeks in a little butter just for a couple minutes so they can soften a bit. stick in a large. Stick in a large bowl with the bread crumbs, cheese (I used an English cheddar), parsley, salt, and pepper. Mix them all together. Then add the egg and mix it in. Stick the whole thing in the fridge and let it chill for awhile (30 minutes to an hour). Once the mixture has thoroughly chilled, pull it out and shape into little cigar/sausage things. Dip the little sausages into the egg, and then roll in the breadcrumbs until they are completely coated. Pan-fry them in oil, making sure to flip them over so both sides get fried. Stick them on a paper-towel-lined plate and serve while still warm. The Result: British food gets a totally unfair rap – all of these dishes were delicious. Ok, the cabbage was merely decent, bit still. 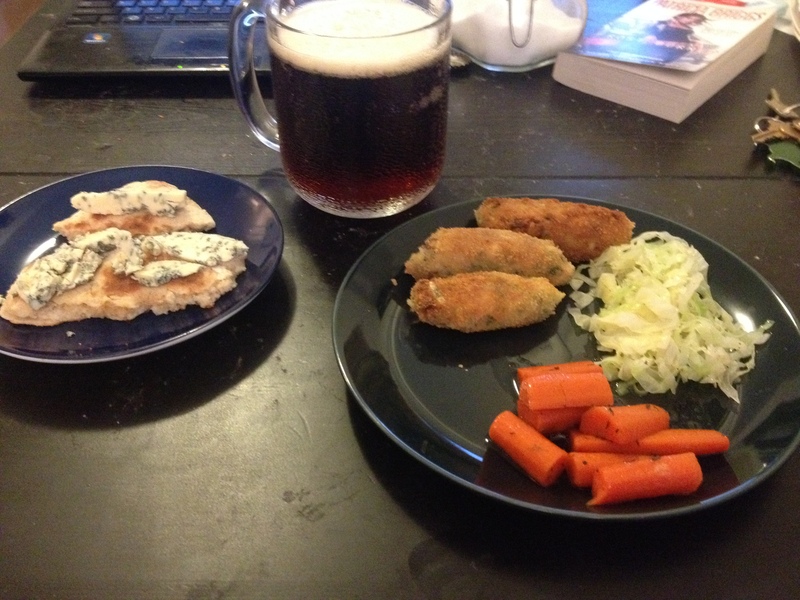 I topped the bannocks with the Stilton cheese, and it was so good. I also ate the leftovers with butter and honey for breakfast the next day – something I highly recommend. And the sausages were super good! 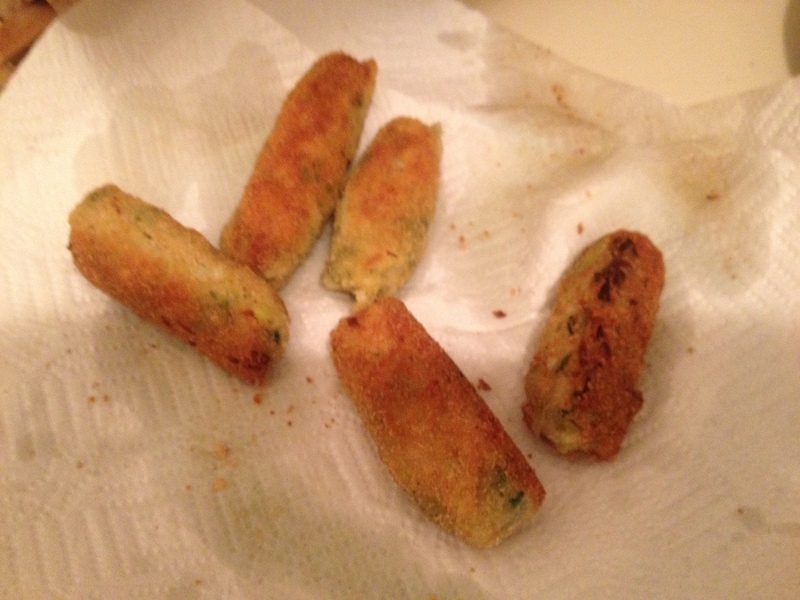 I didn’t make enough – which is always a good sign with a new recipe as it means I just kept eating them. And of course, you must have this meal with an English ale – I chose Newcastle, which is one of my standard go-to beers. This meal is proof that British cuisine is not crap, and vegetarians do in fact have some options. Song of the week: Victoria by the Kinks. The Kinks are a grossly under-appreciated British-invasion rock band, and this song is their semi-sarcastic ode to the Empire. Listen to it and then listen to more of their music – you won’t be sorry. We’ve all been there – when you don’t have a real amount of stuff in your fridge, but have just enough that you are too lazy to go to the grocery store because its not empty per se. Situations like this give you limited options – one of which is the “odds and ends casserole.” It’s one of those situations in which you are trying to cook something tasty with what happens to be around. 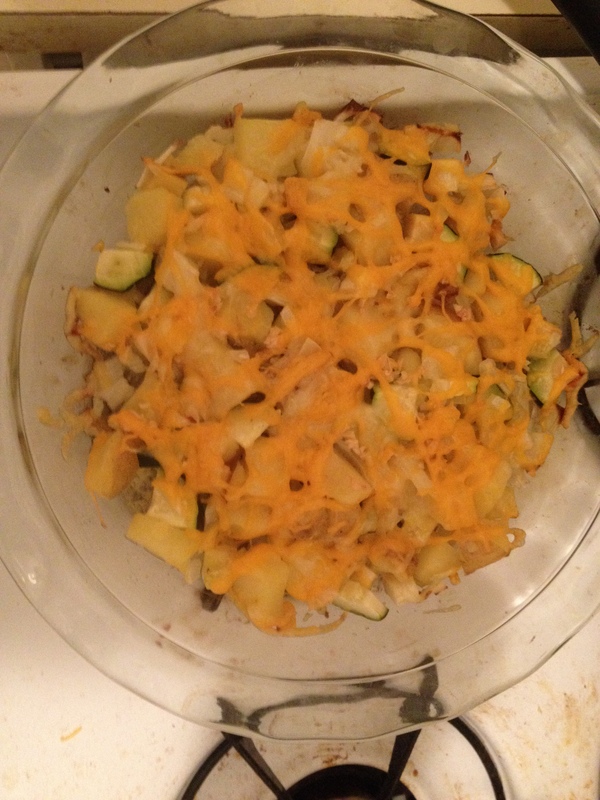 Now, everyone’s fridge is different, but my odds-and-ends casserole involved summer squash, potatoes, and cheese. I’m fairly certain you could change veggies with this recipe easily enough, but don’t quote me on that. Zap the potato in the microwave for a couple minutes, just enough so that its not raw, but not so much that it is thoroughly cooked. Chop in into smallish chunks and toss it into a bowl. Add the zucchini, onion, garlic, salt, pepper, and mix them all together. Take a baking pan, and grease it with the butter. Leave small hunks of butter scattered over the bottom of the pan. Add the veggies. Scatter the cheese over the whole thing, and bake at 375 for 30 minutes, or until the potatoes are cooked through. (The reason you half-cook the potato first is so that you don’t kill the zucchini in the baking process, waiting for the potatoes to cook). The result was pretty good. Not spectacular or anything – I’d have needed some fresh herbs and a stronger cheese to get it up there. But for an odds-and-ends casserole, it was quite good. Of course, you add enough garlic and cheese to pretty much anything and I’ll be happy. This is a good proto-type casserole. Potato, veggie, seasonings, cheese. Basic, easy, and with infinite variations, as a good odds-and-ends dish should be. In the spirit of the dish, you should pair it with whatever beer or wine you have handy. Song of the week: Irreplaceable by Beyonce. Because Beyonce is Queen – even if she isn’t your thing, she’s earned that from the world. And I love the sentiment of the song – I mean who manages to make a break-up song be all self-empowered? And, while B may be fabulous, this is one of her few songs that I truly love (the other two being Crazy in Love and Single Ladies). Summer is coming to an end. The weather is marginally less humid (sometimes) and I’ve moved from white wine to beer. But its not over yet! Since its about the end of it though, I figured I’d make a summery recipe, though surprisingly not one with tomatoes in it. Internet-land brought me to this squash tart, and I knew I had to make something similar at the very least. The result is what I call my end-of-summer tart, with all the summer of yellow squash and zucchini, with a hint of fall with sweet potatoes. Mix together the flour and cheese in a bowl. Cut in the butter with a pastry cutter (or a fork if you don’t have one) until it is all incorporated, and the dough can almost clump together. Add the water, a little at a time, stirring it in with a knife and your hands until a nice dough has formed. Cover with plastic wrap while you get the filling made. Then roll it out and line a pie pan with it (or a tart pan if you have one – I don’t). First cook the sweet potato. In reality, you should roast it, but that takes a while and I was lazy, so I peeled it, chopped it into chunks and microzapped it for a couple minutes. Regardless of how you cook it, you will know its done when it can be mashed with a fork. Mash up the potato, and add the other ingredients, adjusting to your personal preferences. If you don’t have a zester I highly recommend them, they are totally awesome and totally worth it. Mash and mix it all together till its reasonably smooth – either with a fork or a food processor. Spread this mixture over the pastry dough in an even layer. Scatter the garlic evenly over the sweet potato mixture. 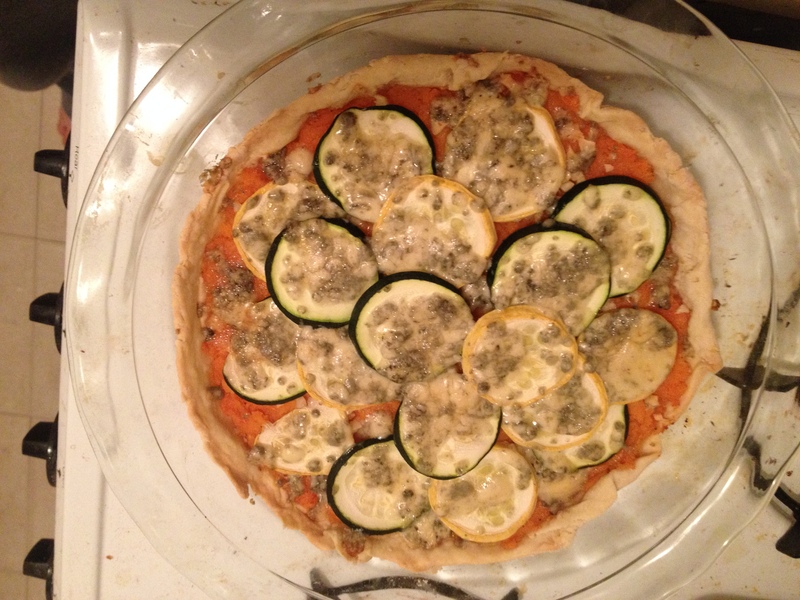 Place the squash and zucchini slices on top. Feel free to make a pretty design and no worries if the slices overlap (although you’ll want some of the orange to peak through). I placed the slices in an alternating yellow-green pattern. Then scatter the cheese over the whole thing. I used blue, but you can easily use goat. Baking does mellow cheese out, so don’t be afraid of using blue if that’s more your thing, or use a slightly stronger goat cheese. Stick the dish in the oven an bake at 350 for around 30 minutes. This might be one of the prettiest dishes I’ve ever made. The colors! Its completely delicious too. Leftovers never seem to last as long as I plan. Seriously though, if you have to bring a dish somewhere or are having a dinner party and want to impress people – make this. I am convinced it will be a crowd pleaser. It reheats reasonably well too, for something with crust. Song of the week: Mr. Brightside by The Killers. Such a good song. Rock and angst and solid lyrics – I never get tired of this song (although I haven’t subjected it to a multi-hour endless repeat session). The band is good, but this song is incredible. Finally, after a month and a half of slow, spastic progress, I finished reading the Aeneid! I am very proud of myself. It’s a worthwhile read, but its important to keep in mind that it was written as a piece of pro-Augustus propaganda – extolling the virtues of the Roman empire while creating a glorious national myth (much like Washington Irving and Longfellow in the US). Regardless, I felt the need to celebrate my own glorious triumph over the poem and what better way to do that than with making Ancient Roman food? I found this amazing blog dedicated to this very topic: Pass the Garum – and after some searching, decided to so my own version of this stale bread salad. The topping is not actually pesto per se, but calling it that was the best equivalent I could come up with so there we go. Take the garlic, cheese, and mint and grind them together with a mortar and pestle. However, if you are like me and don’t have a mortar and pestle, stick it in a heavy bowl, and use the end of a rolling pin to pound, mash, and mix – it works particularly well if you have a French rolling pin (which are 1000 times better than normal ones so you should get one regardless). Just be careful not to break the bowl and you’ll be totally fine. Once you have a paste, add the honey and olive oil and mix it all together with a spoon. Adjust ingredients according to your preferences. So, you have two options now. Spread the pesto stuff on fresh bread or, you can take stale bread and pour posca over it, and then put the pesto on that. What’s posca you ask? Its vinegar water that was a refreshing drink for the Roman army. Take 1 glass of water, and mix it with 1-2 tablespoons of red wine vinegar and a dab of honey (melted).If you have leftover posca, you can simply drink it. The result was awesome. 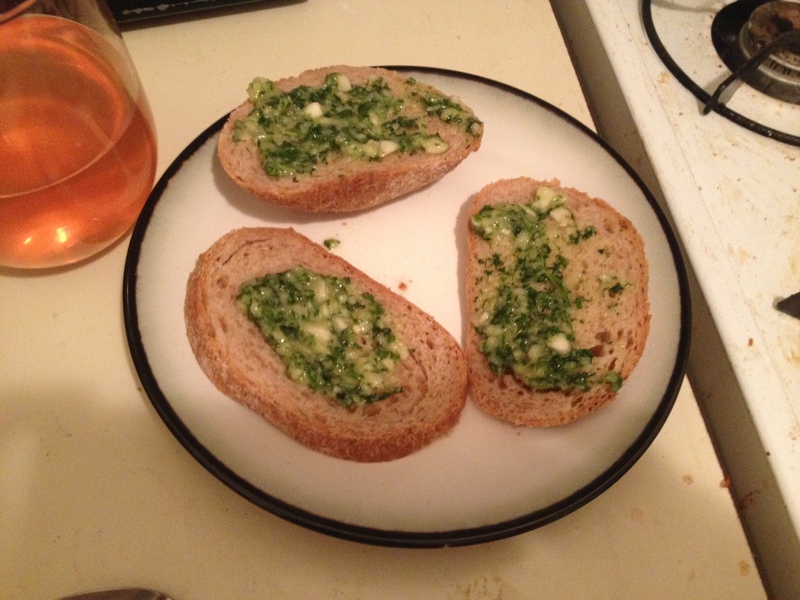 The pesto was obviously incredibly delicious, especially on fresh bread, although the mint flavor gets rather overpowered by everything else – or I possibly use too much garlic … The posca was the true shock – it was good! Let’s be honest, vinegar water sounds nasty, and I already like the taste of vinegar. But its oddly good – particularly if its cold. So be brave and try it! And if you hate it than feel free to blame me for having weird taste buds. Obviously you can pair the pesto with posca, but you should also pair it with a European wine – white or red really doesn’t matter. Just not beer – only barbarians drank beer at this point, according to my brief search in internet-land. Song of the week – Fell in Love with a Girl, by the White Stripes. It’s short, but it is solid rock.